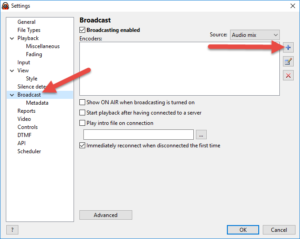 To perform a live broadcast, you’ll need to use a streaming software that supports Icecast server. 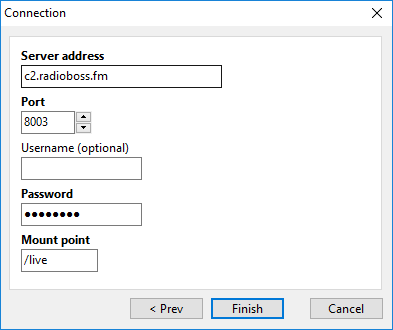 This guide shows you how to connect using RadioBOSS software, but it’s essentially the same with any software. 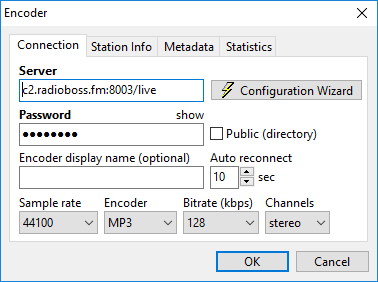 If using RadioBOSS 5.8.1 or newer, you can use the Configuration Wizard to configure streaming to RadioBOSS Cloud. Simply enter your username and password and everything will be configured for you! 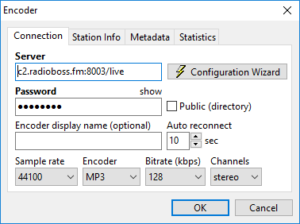 RadioBOSS Cloud automatically transitions between Live and AutoDJ broadcast. 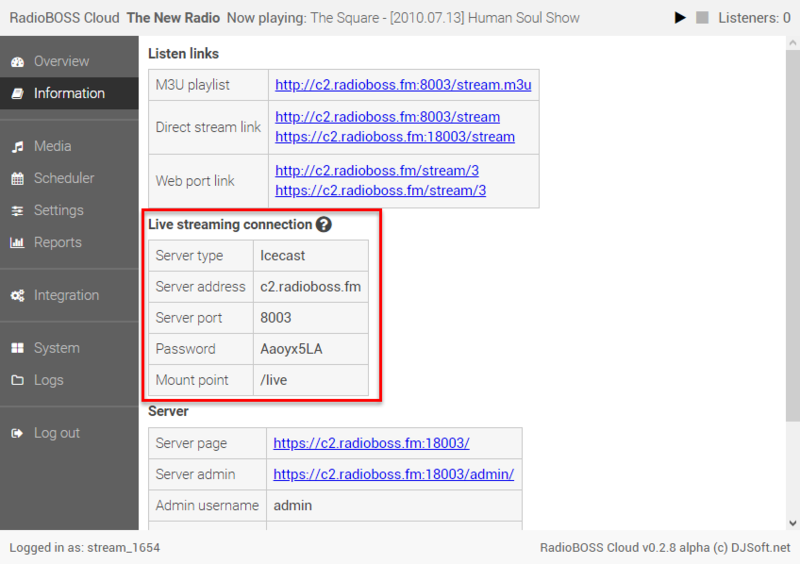 You can broadcast in any format, RadioBOSS Cloud will convert it to your station format automatically. To ensure high quality, we recommend broadcasting at 192 kbps bitrate or higher. The connection settings are located in the Information section in RadioBOSS Cloud. 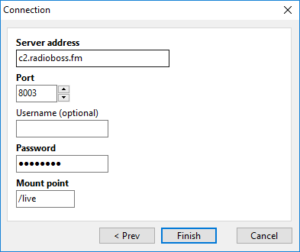 Open RadioBOSS. In the menu click Settings->Options. Navigate to Broadcast on the left. Check the Broadcasting enabled checkbox at the top. Click the “+” button to add a new connection. Click the “Configuration Wizard” button, select Icecast, click “Next“, input the connection details from the Information tab and click “Finish“. The encoder window should now contain server connection details. 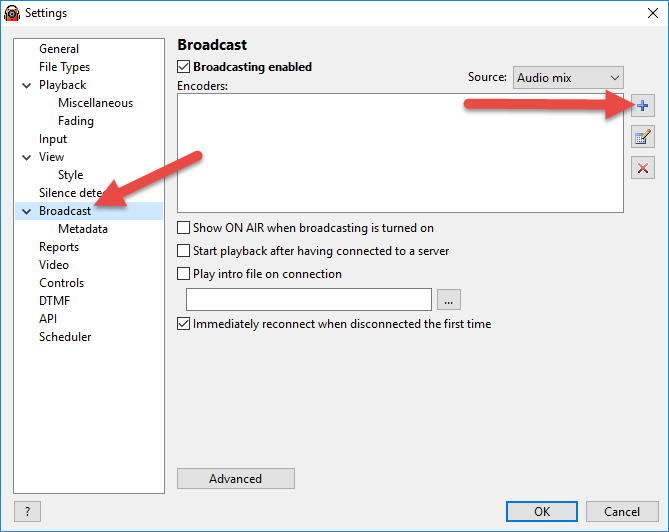 Adjust the streaming format and quality, if needed. If you want to see listener numbers when you broadcast live, you’ll need to set up statistics relay. Click “OK“. The encoder should connect to the server and you should see a message like “Connected to server! (output N)” in RadioBOSS log. If the connection is not successful, please ensure that the settings are correct. Please refer to this page for more information about error messages.